Many RVers swear by motorhomes. Others swear at them. Is a motorhome the right choice for you? First, let’s discuss what they are, and what they are not. As the name implies, a motorhome is a motorized RV. Motor homes are divided into 3 types: Class A, Class B, and Class C. The type describes the chassis and frame that the RV is made from. Class B Motorhomes: Class Bs are converted vans, and from the outside look just like any other Ford or Chevy van. The inside, however, is a different story. Class B manufacturers are able to cram an amazing amount of RVing necessities in these things. Poke your head into a few Class Bs and you’ll see different varieties of beds, dinettes, appliances, even showers. Many RVers swear by Class Bs because they drive like an ordinary car. This means lower fuel bills, easier driving, and far easier parking than Class A motor homes. Class C Motorhomes: You’d think that a Class Cs is smaller than a Class B, but it’s not the case. Class Cs are actually intermediate between As and Bs (in size, not necessarily price). Class Cs start with a van or truck cab, with a specially modified frame added as the foundation for the living space. Typical Class Cs range from 20 feet to 32 feet long. Many RVers like Class C motorhomes because they’re much roomier than Class Bs, but far easier to drive and maneuver than Class As. Is a Motor Home the right choice for you? Here some pros and cons to think about when deciding to buy a motorhome. Pro: There’s nothing else to buy. If you buy a non-motorized RV, you need a tow vehicle to pull it. Obviously, this is not only an extra expense, it’s an additional large-ticket item to research and buy. Pro: You don’t need to learn about towing issues if you don’t want to. Towing an RV can be daunting for a new RVer. You need to learn about the rating for your tow vehicle… worry about gross combined vehicle weights… … choose which hitch or gooseneck to buy, then have it installed on your tow vehicle… learn how to safely connect and disconnect the trailer… make sure you have all the extra gear associated with towing… and more. If you buy a motorhome, you aren’t forced to deal with all this. If you want to move your RV somewhere, you just turn the key and drive away. Note that if you decide to pull a dinghy (a normal automobile) behind your motorhome, you will have to learn something about towing. But you don’t have to pull a dinghy if you don’t want to. Con: Maintenance and service are generally more expensive. Motorhomes will usually cost more to maintain than a towable. Obviously, a motor home has an entire additional set of parts that can break: the engine, transmission, and other systems. In addition, motor homes tend to cost more even for general repairs. For example, a set of tires for a Class A can cost $1,000. Pro: More convenience (in some ways). Cockpit chairs in a motor home can be used in the living space just by swiveling it around. And a couple of steps will bring you from the driver’s seat to your bed—which is very nice when it’s raining outside! (One of the drawbacks of RVing is waking up on the last day of your vacation, and listening to a heavy, downpouring rain outside… and then realizing you have to go out in it to hook up the trailer!) 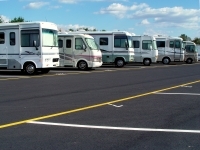 For many RVers, the inconvenience of connecting/disconnecting trailers are the primary reason to choose a motor home. Con: Less convenience (in some ways). Many people don’t like to use or even see the cockpit furniture—they prefer a separation between the driving space and the living space. And the largest fifth wheels can actually provide a little more living space than the largest class As (since the class As use some of the interior space for the cockpit). Pro: Easier to drive. Many RVers are scared of pulling a trailer. A motorhome obviously doesn’t require you to pull anything if you don’t want to. Con: Harder to drive. The largest motorhomes are the size of passenger buses. Many people aren’t comfortable driving something so big. Motorhomes are the perfect RV for many people. On the other hand, many others prefer towables. This is an entire topic in itself. Motorhomes are high-ticket items, and require careful preparation before you buy. But if you do it right, you can save tens of thousands of dollars on your motor home. It’s not that difficult if you know what you’re doing – you just have to do a little homework.